This is the second part to Deaf Machine’s cassette only, extremely rare back catalogue and the follow on from the CD release of ‘Found Noises’; a blistering, crushing and overpowering affair delving deep into the heart of power electronics and cavernous ambient and a release that I took straight to my heart having a soft spot for music of this ilk. 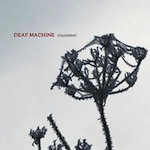 ‘Transistor’ pretty much picks up where the debut CD left off; radio static like drones are left to pulsate over the listener whilst organic sounding materiel is left to waver in the background and be lifted back up with rich Dark Ambience. It’s an odd off-kilter affair and a whole lot more disjointed than the first disc leaving you less time to settle in and in some respects is a lot darker for it; more in touch with some form of brutally cold ‘b’ movie horror than anything else. Mikael Svensson was one of the founding members of Black Ambient masters ‘Megaptera’ and obviously this material is old now; but quality usually comes from people with a pedigree for it in the past and this is by far no exception. ‘Transistor’ however, doesn’t have the immediacy of appeal as ‘Found Noises’ did and I guess that is down to the nature of the time frame the tracks were recorded in (basically a year after his previous cassette release) and as such a different subject matter was probably in mind and does somewhat fit the nature of the title. Taken in context this album does work and I recommend it to all aficionados of this genre; but to grasp the full nature of Deaf Machine in their entirety I would strongly suggest you pick up ‘Found Noises’ beforehand.